No, I’ve still got to go to the internet to do some research for the final exam. For your information, unlike previous semesters where I bought at least one textbook, this semester I didn’t buy any. It’s all because of this reason. So, I have no revision book to look to. So the back up plan was the internet! Just key in the word in Wikipedia.com (for example) and there you go, the exact same information you can get from the textbook. Most importantly, they are free! (not considering the fee for the CC la of course). So my point is that, don’t buy book, go to Bandung instead! Haha... you know what I mean right? Besides the internet, I have e-books also to refer to and of course they are also for free. So what’s the point of buying expensive textbooks while you can get them for free? And what make it worse is that, you buy them but you just take it for granted. You never read it. That’s so pathetic... So not me! Apart from that, among all semesters along my way as IIUM’s Biomedical student, this semester the pressure for the final exam wasn’t that much. I learnt a lot from earlier semesters - don’t be too much pressured, or else you’ll be stressed out! Enjoy the exam instead! And yeah, that’s what I did in this semester – I enjoyed the period all the way through. Whether the paper was difficult to answer or not, that’s different story. I pasted a note on the wall – No Mental Exhaustion. It inspired me a lot. Whenever I felt like my brain cannot take it anymore, I’ll get rest. “Rest” in my way isn’t always the same like other people. Mine is like singing out loud like no one ever bother my out-of-pitch vocal and record it and listen to it again and again, doing some designs with Photoshop, playing simple game like Pairs, getting some short brief sleep with the radio is on loudly, and most importantly going to the CC and do whatever I wanted! When it’s time for prayer, then I’ll perform it and spend some time reading the Quran after that. That’s what I called “enjoy” in order not to get mental exhaustion. The yield – no mouth ulcer this time! That’s a symptom when I’m stressed out, but this time I got none. Congrats to myself. Haha... it worked! 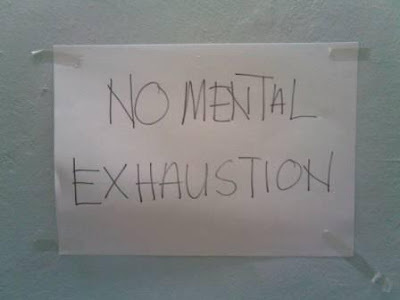 No mental exhaustion! Ok, one more paper to go. This last one is MGT1050K Management for Non-ENM which I suppose not that hard unlike the other core course papers. So I think in this 5-day gap I can make it to cover everything before I step into the exam hall, answer the questions, step out of the hall and shout MERDEKA!!! Terengganu– I’ll see you then! Al-quran is better than others .Wl put our mind in calmness situation. Exhaustion? ?Dont give-up! !u stil young fellow. So many thing you need 2 thingking 4 yr future.D example isss...err...MARY!!?? 3 neg.ni dah ada member blog yg mnunggu.Siap bley wat pmandu pelancong lagi tu..Hoooreyyy!! b.t.w...'hidup jgn myusahkan org'..walaupun org tu ikhlas...tapi sebagai org melayu kita perlu ada prasaan "segan/malu"
dah merapu2 akak in yr comment.SORYYY!!! yo merdeka!!! haha. bape lame cuti? bile masok uia balik?